Oscar and his mama went home last night. Even the dog is mopey, now that her playmate is gone. So we resort to poring through pictures taken last week. These stand out to share, because they show the genius at work. How many two-year-olds do you know who can do this? Huh? 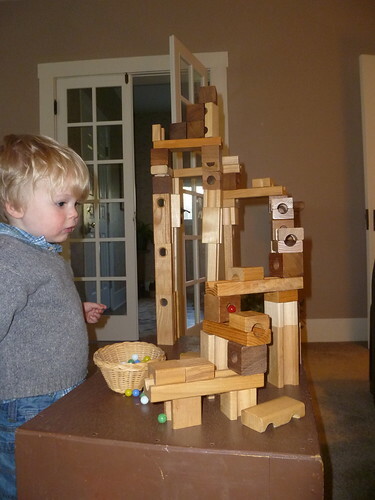 Since you don’t believe he actually built this, I’ll have to fess up that Oscar had a little help from his uncle John. Okay, a lot of help. But Oscar didn’t need anyone’s help demolishing it, and that’s the truth. This entry was posted in 514, family matters. Bookmark the permalink. I love his intense, absorbed look, taking this all in. 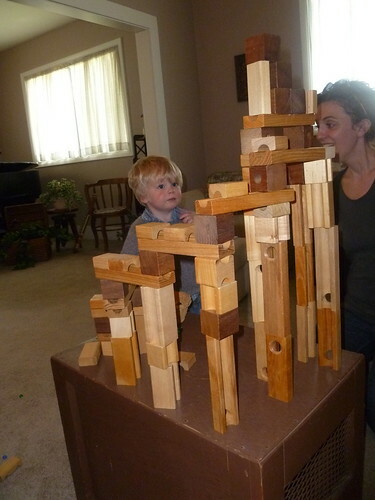 I’ll bet he builds his own before long! He is stinkin’ cute! Wow. So much fun. Great to see pics of Rachel, too. Sounds like you all had fun — in the midst of sad, tiring days. What a sweet boy! How wonderful you all could enjoy him (and his mama) for a few days. Oh my gosh, another Wally in the making!! !